This letter from the Chaophraya Phrakhlang of King Thai Sa to the Governor-General and his Council in Batavia is a notable example of how much Dutch-Siamese diplomacy at that time was concerned with business, or more precisely the ordering of goods from the Dutch by the Ayutthaya court. From his letter it is evident that the Phrakhlang minister knew very well the extent of the VOC’s wide political and commercial reach. His letter asks for cloves and mace from the Spice Islands, perfumed sandalwood from Timor, various types of Indian textiles and Dutch silverware as well as plumed hats. Another byproduct of strengthened Sino-Siamese trading relations, and the Chinese impact on Southeast Asia during this period, was the appointment of a Chinese from Amoy (Xiamen) as the Phrakhlang minister at King Thai Sa’s court. Chinese became influential figures in the royal court, especially in the Siamese crown’s trading apparatus. It was most probably the Chinese Phrakhlang who dictated this very letter to the Hoge Regering. The Hoge Regering’s reply to His Majesty the King of Siam is notable for its polite platitudes and fine phrases expressing continued friendship. The letter from Batavia to the Phrakhlang, on the other hand, is more directly concerned with trade and business. On the matter of the King of Siam’s horse buyers being unable to purchase more suitable specimens, for example, the Governor-General and Council maintained that they had done all they could to help these Siamese officials, providing transportation and granting a generous loan. 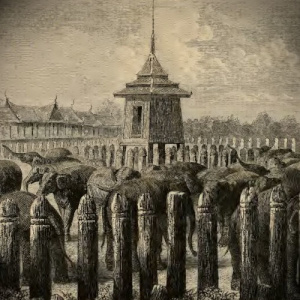 The Dutch consistently assisted the Siamese court from the reign of King Narai (1656-1688) till that of King Borommakot (1733-1758) in its quest to obtain Javanese horses for use in court life at Ayutthaya. Batavia was quite blunt in hinting that the king’s horse buyers were using various excuses to cover their own failure to buy horses which satisfied the court’s specifications. Dhiravat na Pombejra, Siamese Court Life in the Seventeenth Century as Depicted in European Sources. Bangkok: Chulalongkorn University, 2001, Chapter 8 (pp. 146-167). Archives des Missions Étrangères, Paris. Vol. 885, p. 627, Mgr. Brigot aux Directeurs du Séminaire, 9 Jan. 1761. Sarasin Viraphol, Tribute and Profit. Sino-Siamese Trade 1652-1853. Chiang Mai: Silkworm, 2014 (first publ. 1977), Chapter 5 esp. pp. 73-77. See Dhiravat na Pombejra, “Javanese horses for the court of Ayutthaya” in Greg Bankoff and Sandra S. Swart (eds. ), Breeds of Empire. The ‘Invention’ of the Horse in Southeast Asia and Southern Africa 1500-1950. Copenhagen: NIAS, 2007, pp. 65-81.